I always love the opportunity to help my friends pursue their professional dreams, so I was excited when my friend Terri contacted me asking for help with a logo for her new real estate business. She had created an image in the Over app that was close to what she wanted, but wisely sought professional help in making a versatile mark that would display well across different mediums. As you can see below her original logo (on the left) would lose readability at smaller sizes, and printing it in one color or all white would be a problem. Also, she had no usage rights to the feather image. So I created a custom feather illustration for her and moved it out of the way so it would no longer obstruct the text. And now she has a clean, easily scale-able and printable logo that should serve her business well. So, if you live in the New Albany, IN area, you should contact Terri to help with your house-hunting or staging, because she’s awesome. And you should always seek professional help when you need a logo. 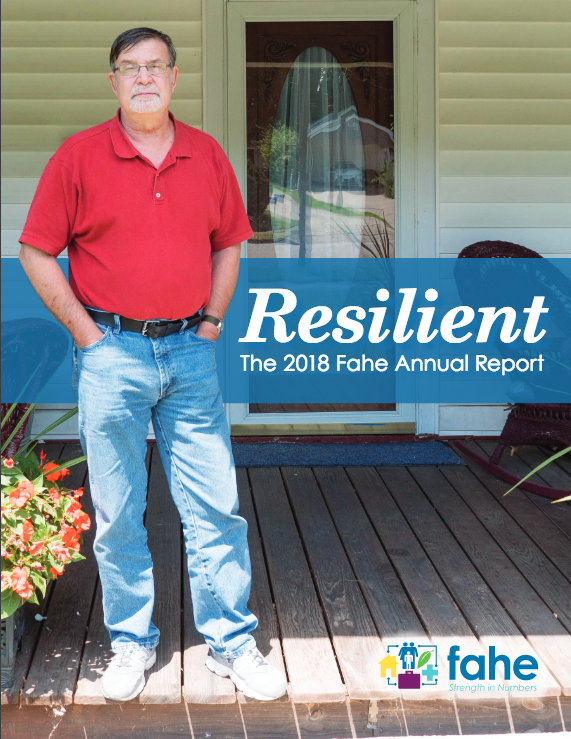 The 2018 Fahe Annual Report is out. This is one of the biggest projects I get to work on with Fahe every year, and It’s always interesting to get to see the positive impact that this wonderful organization makes on the Central Appalachian region each year. You can read all about it here. When a client contacts me about designing a logo, I usually like to work up at least three initial design concepts to present. Since I just finished a logo for So In Sew, LLC, a small quilting business, I thought it might be fun to share not only the finished product, but also the three initial concepts. The client is from Southern Indiana, and she wanted the logo to reflect that. She also mentioned a love for mid-century modern design, so I was able to draw inspiration from the textiles and graphic design of that era as well. When the Real Life Mom Bloggers needed a logo and header for their site, they wanted something that not only reflected the tone of their writing, but also stood out from the typical "Mommy Blog." You can follow the adventures of these funny ladies over at http://www.reallifemomblog.com/. If you're on Instagram and interested in seeing some of the other artist's pin designs, search #quiltconpinswap. When the owner of Factory Finish contacted me about a logo for his paintless dent removal company, the only request he made was to avoid automobile imagery if possible. Because, if you Google "paintless dent removal," pretty much every company logo you see includes some variation of a car silhouette. So I started sketching, playing around with the name "Factory Finish" and focusing on the letter "F." And after doing a little online research, I found a photo of the tools used in paintless dent removal, and I thought to myself "Hey, I see some letters!" So the final logo includes a stylized "F" made from the shapes of the tools of the trade. It stands out from the pack of car-shaped competition, and the bold mark is going to make a strong impression on Factory Finish's customers. Welcome to the newly redesigned Aesop Design Studio! I decided to give Squarespace a whirl to create a website that would not only be easier for me to update personally, but also be easier to view on a smartphone and include a blogging space. So far so good!